RetroUI Pro brings revolutionary technologies to Windows 8, enabling it to be used efficiently on every type of PC. It customizes Windows 8: adds a start menu, makes Windows Store (metro) apps run in a resizable window with a [X] button on the desktop, brings the Taskbar and start menu into the new Start screen, removes hot corners, and much more. 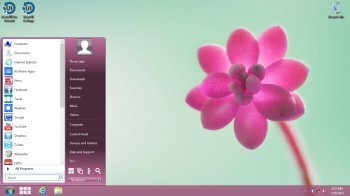 A great program for making your Windows 8 computer more like Windows 7. At first glance it is simple a start menu program but when you start to use it you see it does way more. It has a start menu that looks like the Windows 7 one. It has a bunch of options for configuring it, if you like to do that kind of stuff, though I just use the default settings. The neatest thing other than the start button/menu is that it shrinks the new touch interface so that the desktop is always visible under it. I use 2 monitors and it lets me play angry birds and stretch the game across both monitors, pretty fun. I have had this for a couple months and have gotten several update notifications and seems to keep getting more features and faster.